Highly efficient sound absorbers, these vertically suspended baffles reduce room reverberation and noise levels. Choose from a variety of fabric or vinyl facings. Large spaces like gymnasiums, multi-purpose rooms, restaurants, and atriums are often too reverberant and noisy. 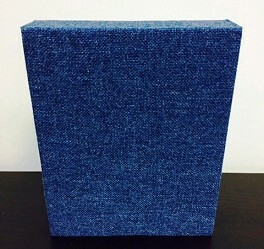 HardSide baffles are extremely efficient sound absorbers providing an excellent solution in these areas. Baffles are easily suspended from overhead structures or stretched cable systems, providing sound absorption where there is insufficient wall space for panels or where additional acoustical absorption is required. HardSide baffles are constructed with two (2) panels of 6-7 PCF fiberglass board with reinforced edges. All faces and edges are covered with a vinyl or fabric finish creating a crisp edge appearance. These lightweight baffles are available in square, round, bevel, mitre, or pencil edge shapes in custom sizes up to 4 ft. x 10 ft. In either new construction or retrofit installations, the HardSide baffle is ideal for those spaces where superior sound absorption is required at the ceiling. Rooms requiring sound absorption at the ceiling level where aesthetics is a priority.